A-G Yehuda Weinstein toured southern Tel Aviv’s neighborhoods, which have been literally taken over by illegal infiltrators from Africa. Attorney General Yehuda Weinstein on Monday evening toured southern Tel Aviv’s neighborhoods, which have been literally taken over by illegal infiltrators from Africa, and was shocked by what he saw and heard. Weinstein was accompanied by the Deputy Attorney General, Raz Nizri, and Dr. Roy Schondorf, who heads a special task force charged with handling international legal proceedings against Israelis. Residents of southern Tel Aviv have been suffering from endless harassment, fear and violence perpetrated by the many illegal Eritrean and Sudanese infiltrators who enter Israel to find employment and come to live in their working class neighborhood. The residents, along with Border Guard officers, accompanied Weinstein during his tour. The local residents approached Weinstein and told him about the daily harassment and crimes they are forced to deal with. Weinstein told the residents that he was glad about the visit simply because it enlightened him as to the reality they face. He added that he planned to come up with a new legal procedure that will prevent the continuation of the status quo. The security fence that was built along Israel's southern border has brought the number of infiltrators almost to a halt, but there are tens of thousands already concentrated in southern Tel Aviv and Eilat, with a smaller number in Arad, Ashdod and other areas. Interior Minister Gideon Saar recently toured southern Tel Aviv in an effort to learn up close about the infiltrator problem, which former MK Yaakov Katz (National Union) brought to the country's attention as head of the Knesset Committee on the issue. In April, MK Elazar Stern (Hatnua) was attacked by an illegal infiltrator from Eritrea as he was visiting neighborhoods in southern Tel Aviv. 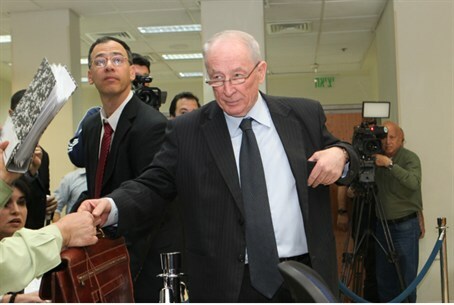 During the visit, Stern tried to cross a street along with the residents, when an infiltrator, who had been following them, tried to obstruct his way. One Israeli resident yelled at the infiltrator and asked him to go away. The illegal infiltrator reportedly opened his shirt to show a large cross, then attacked Stern from behind and hit him in the head, knocking down his kippah and stepping on it. "If they would disperse the infiltrators in other neighborhoods in the country things would look different," added Stern.